Whole genome doubling (WGD), a frequent occurrence during the evolution of the angiopsperms, complicates ancestral gene order reconstruction due to the multiplicity of solutions to the genome halving process. Using the genome of a related species (the outgroup) to guide the halving of a WGD descendant attenuates this problem. 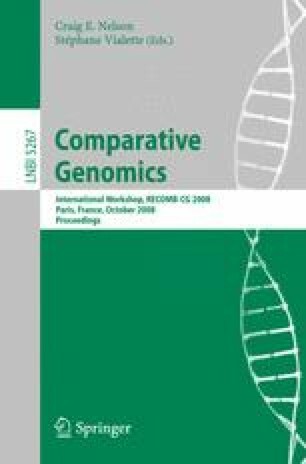 We investigate a battery of techniques for further improvement, including an unbiased version of the guided genome halving algorithm, reference to two related genomes instead of only one to guide the reconstruction, use of draft genome sequences in contig form only, incorporation of incomplete sets of homology correspondences among the genomes and addition of large numbers of “singleton” correspondences. We make use of genomic distance, breakpoint reuse rate, dispersion of sets of alternate solutions and other means to evaluate these techniques, while reconstructing the pre-WGD ancestor of Populus trichocarpa as well as an early rosid ancestor.